Merry Christmas everyone! There’s something really magical about Christmas. Maybe it’s the beautiful decorations and lively music that fill shopping malls and streets. Maybe it’s the extra smiles and warmth in peoples’ attitudes as we celebrate the accomplishments of one year and welcome a new beginning. Whatever it is, Christmas is definitely my favourite holiday and it’s a great excuse to come together with friends to celebrate! What’s your favorite holiday of the year? I recently met up with my friend Monty for coffee and discovered that she shares the same passion for cooking as me! She recently moved back to Hong Kong after completing a diploma in pastries from Le Cordon Bleu London and is now a lawyer by day and talented pastry chef by night. As Winter is here, I thought it would be perfect to invite her to create two Christmas/Winter inspired guest recipes. The first is this winter wonderland inspired yule log made of layers of dark chocolate chiffon cake, coconut cream, and dark chocolate ganache. The coconut cream is actually made from fresh coconut milk and gives it a unique rich creaminess that is balanced by the tartness of the fresh berries and slight bitterness of the dark chocolate. The chiffon cake is light and airy. And did I mention this is completely flour-less? 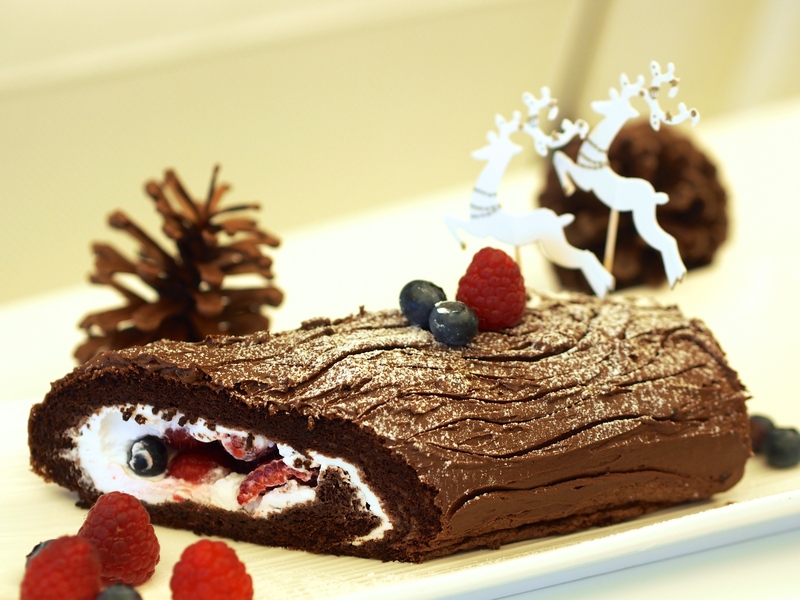 What I love most about this yule log is that not only is it delicious, but it’s also a beautiful art piece. It brings me back to a wooden cabin in Whistler with the fire burning nearby, it’s freezing outside and the windows are speckled with snow, and we’ve just come home after a long day of skiing. How awesome would life be if I could just sit down with a slice of this cake and a cup of hot coco? Well, obviously it doesn’t snow in Hong Kong but why not bring ourselves back to winter wonderland with this cake! Bring this to your next gathering or grab a bunch of girl friends over to make this together on a chilly winter night. We’re sure you are going to love this! Last but not least, thank you Monty for this wonderful recipe! The next recipe from Monty is a fresh sweet potato tart- perfect for this cool Winter weather. If you guys have any questions for Monty, leave them in the comments below! 2. 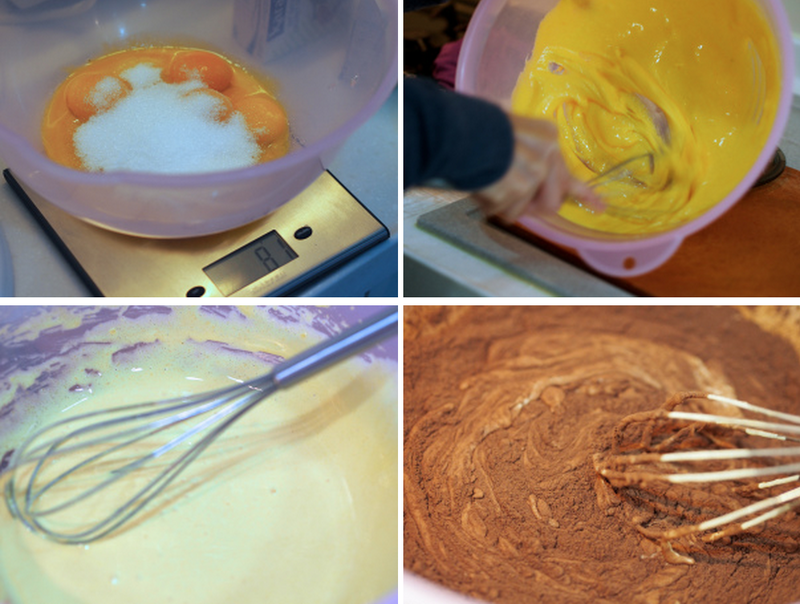 In another bowl, whisk the egg yolks and the remaining caster sugar until the mixture is moussy, pale and thick. 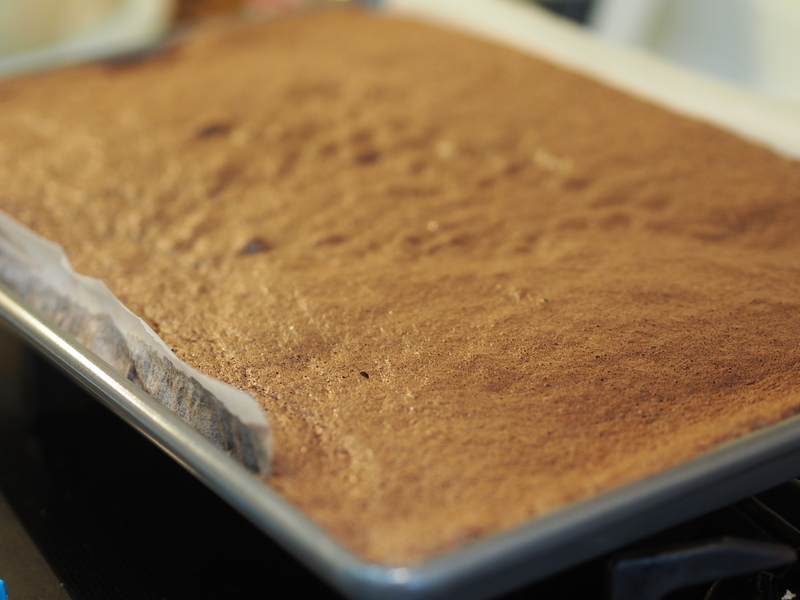 Add the vanilla extract, sieve the cocoa powder over, then fold both in. 3. 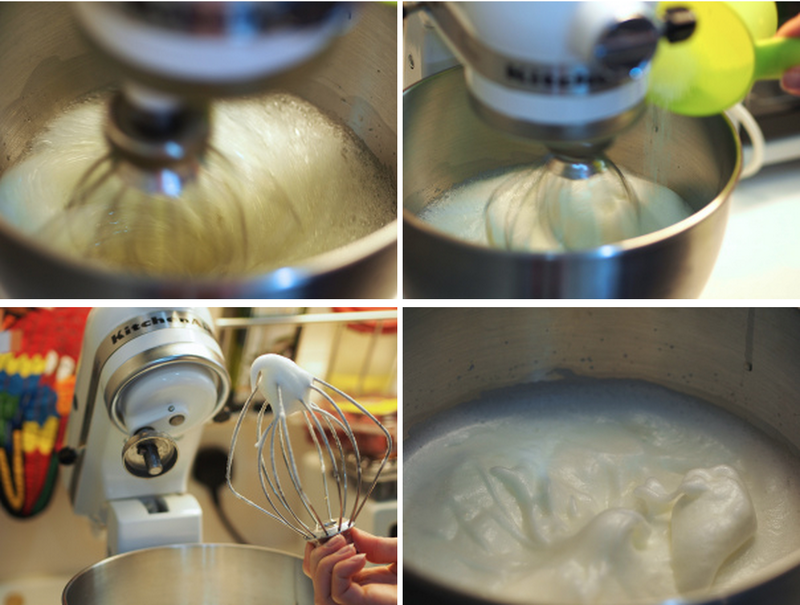 Lighten the yolk mixture with 1/3 of the egg whites (mix thoroughly without worrying about losing the air). Then, add the remaining whites in thirds, folding them in carefully to avoid losing the air. 4. 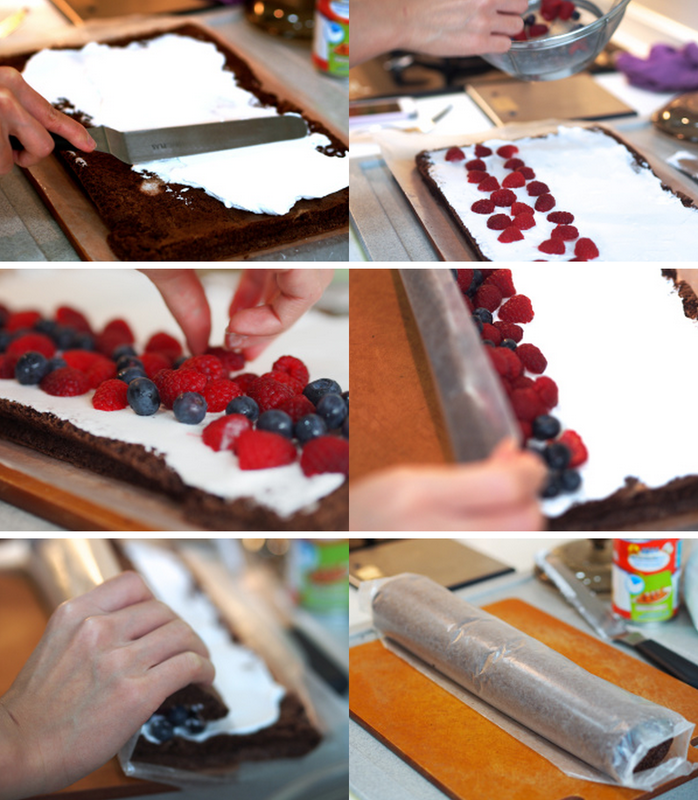 Line a Swiss roll tin with baking parchment, leaving a generous overhang at the ends and sides, and folding the parchment into the corners to help the paper stay anchored. Pour in the cake mixture and bake in the oven at 180 C for 20 minutes. Let the cake cool a little before turning it out onto another piece of baking parchment. 1. Whisk the coconut cream to medium peaks. 2. Wash the berries and you may wish to cut them to smaller, even sizes. 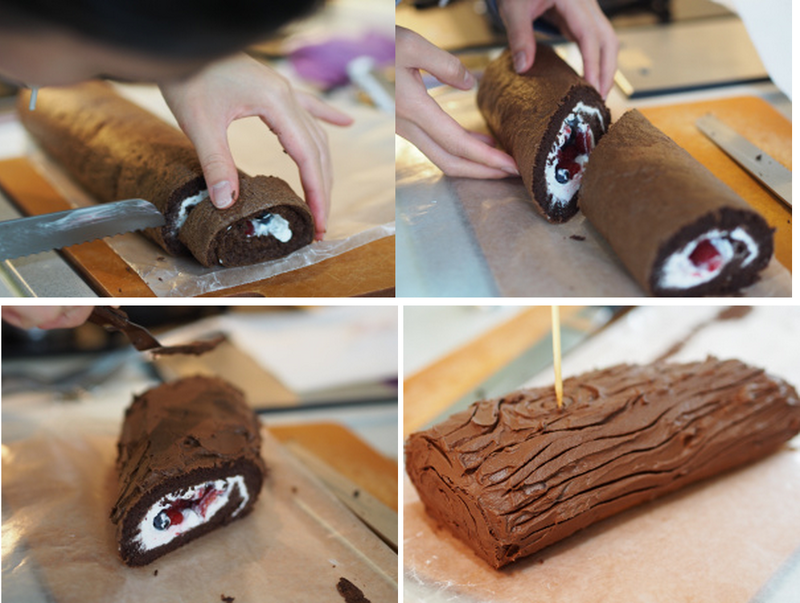 Assemble the yule log by spreading the coconut cream on the chiffon cake, evenly spreading out the berries on the bottom third of the cake, and rolling the cake upwards and inwards to form a roll. *Keep it in the fridge until the chocolate ganache is ready. 1. Melt the chocolate over a bain marie. Meanwhile, heat the cream but don’t let it boil. 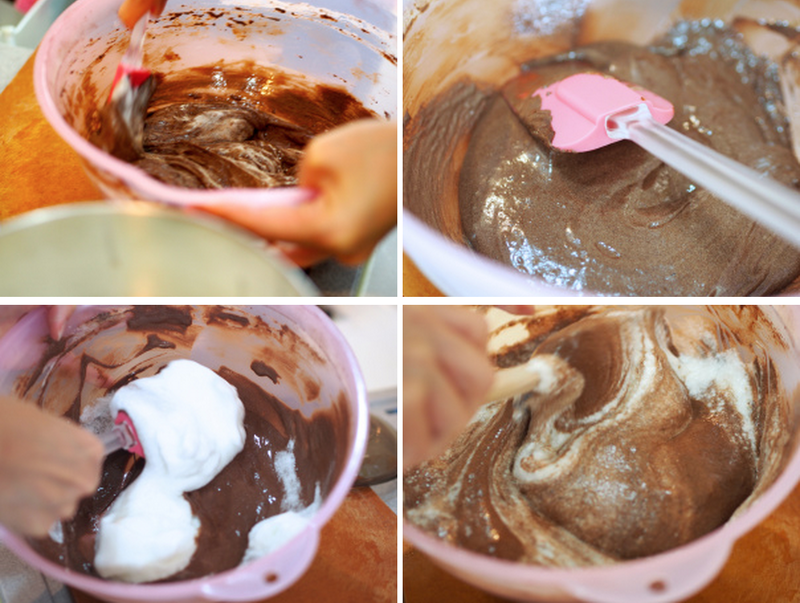 Pour the hot cream into the melted chocolate gradually and whisk. *Let the chocolate mixture cool. You can place it in the fridge but keep checking it to make sure it doesn’t thicken or harden too much as you want to be able to whisk it. It should be the consistency of heavy cream. 2. 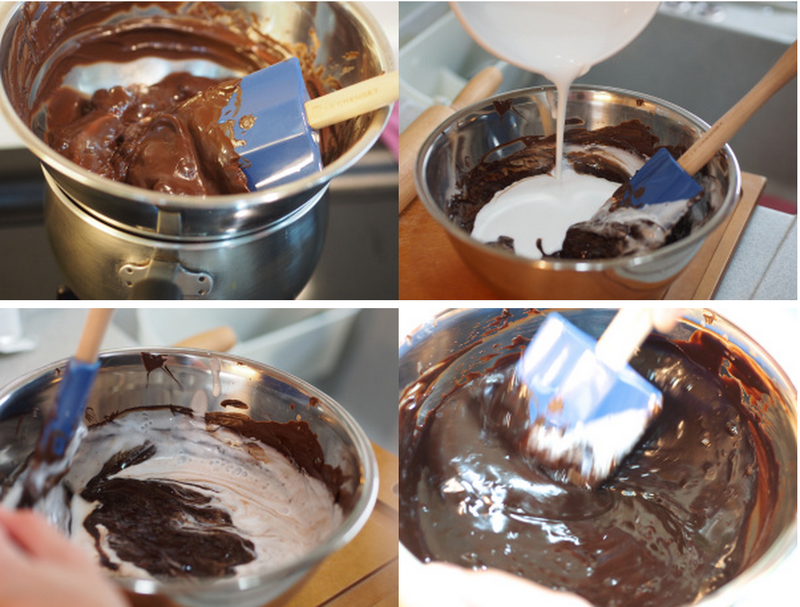 Once the ganache has cooled, whisk until it thickens. 3. Finally, cover the log cake with the creamy chocolate ganache! 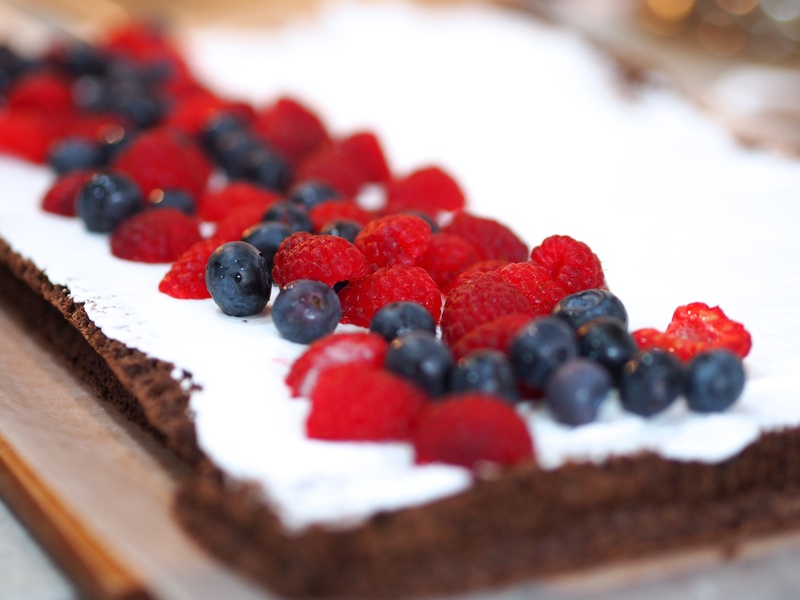 Slice off the less attractive ends of the chiffon cake to reveal more of the coconut cream and berries, slice diagonally to create a log-like shape, spread the ganache on top, and decorate with log-like marks. Frost with icing sugar to create the illusion of snow and decorate as you wish! We hope you enjoy this recipe! Please send me photos if you ever try it and don’t miss any future recipes by subscribing below!